President-elect Obama's choice of Arne (pronounced "arnie") Duncan for education secretary startled me a bit, because I expected Obama to name either an accomplished academic to the post (like Linda Darling-Hammond), or someone with broader experience in the trenches of education, that is, involving more than being a capital-fund-supported educational "reformer" or CEO of the Chicago Public Schools. Duncan has never taught in a K-12 school--other than tutoring...attended the U of C Lab Schools and Harvard (and so has no experience being a student in a public school)...and lacks an advanced degree (even a master's degree) in education. Plus, while some credit Duncan with righting a sinking ship in Chicago during the last seven years, I think in fact any "improvement" in Chicago Public Schools has been primarily in terms of the public perception of the schools and some tinkering around the edges of accountability and choice. So what are Duncan's qualifications to be education secretary? 1. Duncan is a consummate diplomat. Since the primary job of the education secretary is to "sell" federal programs to the public at large and other constituencies such as teachers unions, this is the primary reason he was chosen. He's well-spoken without coming across as aloof. He sounds like a regular guy, even though he's a Hyde Parker through and through, son of two well-respected University of Chicago academics. (I think perhaps Duncan's basketball career has given him a visceral connection to people who lack an academic bent: "I've been fortunate to go to some of the top schools in America...but I can tell you, without a doubt, that some of the best lessons I've learned in life are from playing basketball on Chicago's inner-city playgrounds. There's nothing like it", Chicago Tribune, July 11, 2001.) Like Obama, he has a huge natural smile that disarms his critics. I've heard Duncan speak in public a number of times, and while he advocates reforms (mostly along the very moderate lines of improved teacher training, replacing enormous failing high schools with small schools, more charter schools in disadvantaged neighborhoods, and using better data for decision-making), he NEVER says anything particularly upsetting or polarizing (in contrast, say, to Paul Vallas). Duncan is also not adverse to defending his boss (Richard Daley, for example), and he does so in a masterfully tactful manner that leaves even critics of that boss nodding their heads at Duncan's defense. 2. Duncan is smart. He listens. As mentioned above, he pays attention to data. Educationally-oriented academics (such as Tim Knowles, director of the Urban Education Initiative of the University of Chicago (and my former boss) love him. Duncan is persuadable. He doesn't think he knows it all, and is willing to let smart, dedicated professionals do their jobs within broad policy constraints. He's an excellent executive. 3. Duncan is a pragmatist. One thing about Barack Obama that strikes me--especially in terms of educational policy but perhaps more generally--is that he seeks pragmatic solutions to policy problems, while adhering generally to the consequentialist belief that the best policy is that policy that benefits the most people. ("Arne has always seen education as a civil rights issue." — Phyllis Lockett, CEO of the Renaissance Schools Fund, a non-profit that works with Chicago schools, Chicago Tribune, Dec. 16, 2008.) Duncan shares this pragmatism. Neither man, despite being Hyde Parkers, U of Cers (in some sense), and Democrats, is an idealogue. They will not pursue policies (such as the Bush program of "evidence-based" programs) that are merely screens for tactics in the culture wars. 4. Duncan is not only pragmatic, but he is also independent. He is not beholden to any political or entrenched interest. He's not "pro-union"; nor is he "anti-union." He's not for privatization of public schools, but he's not opposed to outsourcing when it improves results. He's also not opposed to closing underperforming schools. (When he first started doing this in Chicago, he raised a tremendous outcry of opposition from teachers, students, and community organizers. He learned from this experience and changed his tactics. Now, you hear almost no sustained opposition to this policy.) While he's surely a Democrat, and likely a liberal in his personal political views, he exudes a kind of beneficent concern for all stakeholders that will play very well in Washington policy circles. 5. He plays basketball....very well, and Obama likes to play with him. 1. NCLB will be drastically restructured to focus on supports for improvement rather than negative consequences for failure. 2. Opponents of charter schools have lost a huge battle. Their expansion will continue dramatically. 3. Urban school districts will receive special attention from Washington. 4. Washington will now begin to push a longer school day and longer school year, and the public will be gently pressured to force the unions to accept this without getting higher pay. 5. Funding for educational research will no longer be tied to ideological criteria such as "evidence-based" practices. Rather, research will be judged in terms of its likely benefit to generalized issues of educational practice. 6. The bowling alley in the White House will be replaced with a Basketball Court. 7. Barbara Eason-Watkins, who has been the quiet but effective and resolute Chief Education Officer of the Chicago Public Schools for the past 6 years, will become Chicago Schools Chief. Barbara (who was also my boss for about 3 months before she took her current position) is smart, friendly, tireless, effective, and has deep experience at all levels of the system. Expect Eason-Watkins to make news within the next few years, most likely by saying things that no white man could say in that position. She may shake things up a bit in Chicago (which would be quite welcome). While I was startled that Obama made this pick, I think it was a good one. Duncan will do Obama's bidding without even having to be told what that is. He will be well-liked by pretty much everyone. And he will work to generally increase federal involvement where such involvement can make a difference, and will advocate strongly for "investment" in education in a way that will be convincing to most Americans. Thoughts on Obama's "Consensus Choice"
It’s interesting that Obama has chosen Arne Duncan, the Chicago schools superintendent “known for taking tough steps to improve schools while maintaining respectful relations with teachers and their unions.” What we might expect from this “centrist” choice is a focus on improving the educational outcomes of poor students, a goal that virtually all progressives can certainly support. What is especially useful about the “Broader, Bolder” policy statement is the recognition that schools alone can not be held responsible for the achievement gap, and that a broad range of health and social policy commitments must accompany any school reform proposals. I also appreciate the focus on quality early childhood education, in order to eliminate the need for later remediation. And at least the “Broader, Bolder” statement nods to the fact that NCLB is responsible for a “narrowing of the curriculum,” although we need a much broader, deeper , and well-defined public discussion about what this means and what we should do about it. If Obama and Duncan lean towards the “Broader, Bolder” approach and there is every possibility that they will, we might expect a different kind of conversation about educational reform than we have had in the public sphere to date. The best thing that could happen is that the feds make a broad commitment to policies that will really level the playing field for all students in public schools and work to provide national resources to do this. But let’s not put all our faith in the federal government for the specifics. Too much centralized power over the day to day workings of schools leads inevitably, I respectfully submit, to standardization, homogenization, and further bureaucratization of educational decision-making. States and local communities have historically been the actors most involved with setting more specific educational policies and I believe that in the context of national platforms on equality and justice, and the appropriate federal level of financial commitment to ensure these broad goals, we should return real control over curriculum and instructional practices to those closest to the site of learning: teachers, parents, communities, and - yes - students! 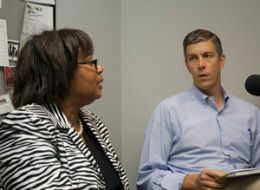 The Associated Press today reports in an article that Arne Duncan, selected to lead the Education Department in the Obama administration, is a consensus pick whose selection avoids picking sides between the two educational policy reform camps. "Duncan's selection may satisfy both factions. Reform advocates wanted a big-city school superintendent who, like Duncan, has sought accountability for schools and teachers. And teachers' unions, an influential segment of the party base, wanted an advocate for their members; they have said they believe Duncan is willing to work with them. Duncan deliberately straddled the factions earlier this year when he signed competing manifestos from each side of the debate." According to Lyne Sweet, in a column for the Chicago Sun Times, President-elect Obama will name Arne Duncan, head of Chicago's Public Schools, to be Secretary of Education. According to the article in Wikipedia, Duncan is the son of Starkey Duncan, a psychology professor at the University of Chicago, and Susan Morton, who runs a Children's Center on the city's south side for African American youth. Duncan played pro basketball for three years after graduation while also devoting himself to children's issues. 1998 he joined the Chicago Public Schools, where he became Deputy Chief of Staff for former Schools CEO Paul Vallas. Mayor Richard M. Daley appointed Duncan to his current post on June 26, 2001. He plays in pick up games with Obama, and is close to several members of Obama's advisors and transition team members. Duncan, according to various reports, has demonstrated a good deal of savvy in dealing with his various constituencies. His appointment may be viewed as avoiding some of the divisiveness that would have resulted from the selection of Linda Darling-Hammond of Stanford or Joel Klein of the New York Schools, though he would appear to be somewhat closer to Klein as both are big city school administrators. The split in educational policy frameworks within the democratic party that was discussed last week by David Brooks is widening and getting nastier. According to a new article in the Times "there is mystery not only about the person he will choose, but also about the approach to overhauling the nation’s schools that his selection will reflect." As characterized by Bruce Fuller, an education professor at the University of California, Berkeley, one camp, led by Linda Darling-Hammond, and supported by the teachers unions, advocates improving teacher training and teaching conditions. Darling-Hammond (a graduate of my department at Temple), is the Charles E. Ducommon Professor of Education at Stanford. The other side, led by "efficiency" reformers such as New York school Chancellor Joel Klein, favors merit pay and limits to tenure. The efficiency reformers say that the Darling-Hammond camp, though clever at hiding it, is opposed to significant reform. The Darling-Hammond camp say that the efficiency reformers are tough love --- without the love. So far, no hint from President-elect Obama about which camp will dominate educational policy in the new administration. Both sides considerable negatives when viewed from the progressive point of view. The Darling-Hammond side may be too entrenched in status quo institutions and approaches. The Klein camp is much more experimental, but its experimentation is driven by considerations of narrow efficiency. What do others think about this choice? In an important column in the New York Times on December 5th David Brooks surveys the educational policy frameworks competing for President Elect Obama's sponsorship. With the Republicans out of the loop on educational policy, the key issues will be decided by Democratic party in-fighting, so it is essential to follow these internal squabbles. On the one hand, there are the reformers like Joel Klein and Michelle Rhee, who support merit pay for good teachers, charter schools and tough accountability standards. On the other hand, there are the teachers’ unions and the members of the Ed School establishment, who emphasize greater funding, smaller class sizes and superficial reforms. Brooks thinks that Darling-Hammond in the deputy secretary role would be the worst outcome, as she can maneuver against his preferred brand of reform under the radar while a political celebrity secretary of education offers sweet nothings to the press. The New York Times reports that Wyeth, the big pharma company, has developed a novel system for producing medical research. The Times article states that Wyeth hires out the research to a ghost writing firm, DesignWrite. That subcontractor takes the idea from Wyeth, drafts the article targetted for a particular journal, and then recruits a prominent "medical researcher" to sign it. One article was published as an “Editors’ Choice” feature in May 2003 in The American Journal of Obstetrics and Gynecology, more than a year after a big federal study called the Women’s Health Initiative linked Wyeth’s Prempro, a combination of estrogen and progestin, to breast cancer. The May 2003 article said there was “no definitive evidence” that progestins cause breast cancer and added that hormone users had a better chance of surviving cancer. The issue of ghostwriting for medical journals has been raised in the past, involving various companies and drugs, including the Merck painkiller Vioxx, which was withdrawn in 2004 after it was linked to heart problems, and Wyeth’s diet pills, Redux and Pomdimin, withdrawn in 1997 after being linked to heart and lung problems. One top medical researcher with more than a thousand articles to her credit, when confronted with evidence gathered by Senator Grassley's senate committee that she had signed on to ghostwritten articles plugging Wyeth drugs, said "It kind of makes me laugh that with what goes on in the Senate, the senator’s worried that something’s ghostwritten. I mean, give me a break." And that's the gold standard in attitude! Last month, I explained the origins of Québec's new ethics and religious culture course, and I noted that it seemed to be on the cusp of becoming a significant issue in the provincial election campaign. I also pointed out that Mario Dumont, a right-wing politician, had tried to take advantage of public controversy surrounding the new course (it was alleged to be overly secular), and I promised that I would give an update on whether the issue caught fire. Interestingly, the issue did not prove to be to M. Dumont's advantage at all--the general public was, apparently, not interested in his criticisms. On Dec. 8, Dumont's party, the Action Democratique de Québec (ADQ), was crushed at the polls, and was reduced from 41 seats to 7. Dumont immediately resigned from the leadership of the ADQ as a result of this poor showing. In the previous (2007) election, Dumont had profited politically from a media frenzy (which he helped to incite) surrounding the question of reasonable accommodations for immigrants and religious minorities. 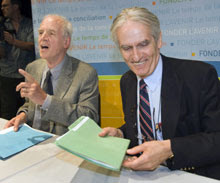 This controversy resulted in the formation of a traveling commission chaired by philosopher Charles Taylor and historian Gérard Bouchard (see photo above). In May of 2008, Bouchard and Taylor released their final report on the matter of reasonable accommodation, entitled Building the Future: A Time for Reconciliation. ([The media account]) Muslims arrived one morning at the sugarhouse, which can accommodate 750 people, and demanded that the menu be altered to conform to their religious standard. All of the other customers were therefore obliged at noon that day to consume pea soup without ham and pork-free pork and beans (this prohibition was apparently subsequently extended to other sugarhouses). In the afternoon, the same Muslims entered the crowded dance hall and interrupted the festivities under way (music and dancing) to recite their prayers. The customers in the dance hall were expelled from the sugarhouse. ([The commission's account]) One week before the outing, a representative of Astrolabe, a Muslim association, met with the sugarhouse’s owners to discuss certain changes to the menu, which would apply solely to the members of the group. The modified menu excluded pork meat but included halal sausage and salami provided and paid for by Astrolabe. This arrangement having been made, the association reserved one of the four dining rooms in the sugarhouse for its exclusive use. On the appointed day, after the meal, members of the group moved several tables and chairs in the room reserved for them for a short prayer. The management of the sugarhouse wanted to free up the room as quickly as possible (business was brisk and nearly 300 customers were waiting to be seated) and proposed to the 40 or so individuals who wished to pray that they use instead the dance hall, which can accommodate roughly 650 people. Thirty or so customers were then in the room, some of them waiting to be seated in the dining room. Several young girls were dancing to popular music. The management of the sugarhouse interrupted the music so that the Muslim customers could say their prayers, which took less than 10 minutes. The music then resumed. According to the management, no one was expelled from or asked to leave the dance hall. See Building the Future: A Time for Reconciliation (Québec: Gouvernement de Québec, 2008), 72. In the report, Bouchard and Taylor discuss what they call the media's "Fabrication of Perceptions," and they note that there was a significant amount of public outrage about the role of the media, both from the general public as well as from individual members of the media. Clearly, Bouchard and Taylor have some of the same concerns about the shaping of public perceptions that preoccupied Dewey and Lippmann during the 1920s. Books like Public Opinion (Lippmann), The Phantom Public (Lippmann), and The Public and its Problems (Dewey) still shed a great deal of light on these kinds of issues. Obviously, this is an issue that extends far beyond the Québec context, and which poses an ongoing and difficult (albeit fascinating) educational challenge. A couple of weeks ago, Nebraska revised its “safe haven” law. ( Nebraska Revises Child Safe Haven Law: NYTimes) Nebraska was the last of the 50 United States to pass such a law, which allows parents to hand their children over to the state without fear of prosecution. These laws are generally intended to prevent what the media nicknames “dumpster babies”: newborns abandoned in out-of-the-way places by desperate young mothers. When it passed its law, however, Nebraska left open the possibility of handing over children up to the age of 18. Legislators were soon dismayed to find a surprisingly high number of teenagers handed to the state for safekeeping, including children from other states. Why? This law coincides with rising health care costs and decreasing governmental support for parents. In an article about the revision to Nebraska’s law, the New York Times focuses on the mother of three children, two of them bipolar, one of whom was uncontrollably violent, who could not afford the health care her son needed. She is shown weeping, and says she cries every night but abandoned her son to the state because it was the only way for him to get the care he needs – and for her to take care of her other two children. About a year ago, President George Bush vetoed plans to expand S-CHIP, the government program that provides health care to children of the working poor and middle class. He argued that this expansion would have provided a safety net to people who did not really need it. The surprising turn of events in Nebraska strikes me as powerful evidence (for anyone who still had doubts) that this argument is nonsense. Referring to events in Nebraska, a recent editorial in the New York Times pointed out missing social safety nets and called on the government to provide them. I agree with the editorial but think that more than financial resources are at stake here. The stories from Nebraska highlight some troubling issues that are also raised by the problem of child abandonment more generally. Why are young women so ashamed to bear children that they leave them in dumpsters, bathrooms, wherever they can hide them? Why is it made so difficult for women with children to finish school, find good jobs, make a good place for themselves and their children in the world? Why is having a child the end of freedom and possibility to many women? Why do we arrange the lives of children such that their parents bear so much, too much, of the weight of their happiness? Surely it could be otherwise. Thirty years ago, in Of Woman Born, Adrienne Rich addressed the despair children can bring even to mothers who love them dearly. Rich’s words are brave and worth thinking about. Children are often romanticized as a constant wellspring of delight; they are not always so. If we could acknowledge that, and find ways to provide moral and social, as well as financial, support to parents (especially mothers, but fathers too), children would be less threatening and less threatened. In Nebraska and elsewhere. Jean-Jacques Rousseau abandoned his 5 children to foundling hospitals, where they likely died soon after. There are plenty of parents (mostly fathers) abandoning children wrongly, selfishly. Rousseau regretted his decision after the fact, and the experience inspired him to write Emile (a book which plays no small part in the romanticizing of childhood, it must be said). But Therese Levasseur, Rousseau’s lover and companion and the mother of those children, is the parent who most comes to mind. The story would be less heart-wrenching if it had been possible for her to keep those babies. Times have changed, but as long as motherhood is an experience of entrapment (not for all, but for too many), times have not changed enough.